City, Sandwell and Walsall Breast Screening Service is part of the NHS National Breast Screening Programme and provides free, routine screening once every three years for women aged between 50 and 70 years in North, East and West Birmingham, Sandwell and Walsall. The service has four mobile breast screening vans which move around the areas served so that women can be screened closer to home. Breast screening involves having an X-ray (mammogram) of each breast, which is taken while carefully compressing the breast. The mammogram looks for breast cancers before they produce any signs or symptoms, when they are too small to be seen or felt. Our team works collaboratively with the local learning disability health teams who support women with learning disabilities with breast screening and other health issues. 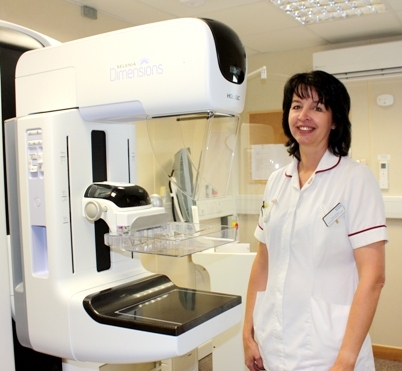 Breast screening is routinely offered to all women in our area who are aged between 50 and 70 years. You will automatically be sent a letter every 3 years inviting you to come for a screening as long as you are registered with a GP. You will receive your first invitation for breast screening before your 53rd birthday. If you are over 70 years of age you may not automatically be invited for screening but it is still free and available; you just need to call the Breast Screening Office to arrange an appointment. From December 2012 the NHS National Breast Screening Programme has increased the screening age range to 47 – 73, as part of an ongoing trial, and so some women from the new age groups will receive invitations for screening as a result of this. If it has been over three years since your last screening appointment or you think you are due for screening please contact us. The service also works with the local learning disability health teams. If you have a learning disability and would like support with any health issues you can contact them. Their details are on the ‘Contact’ page. Where do I need to go for breast screening? Your invitation letter will tell you the location, date and time of your appointment. Screening usually takes place on one of our mobile screening units in a location within the community and occasionally at the breast unit at the Birmingham Treatment Centre, City Hospital or Walsall Manor Hospital. Only women work on the mobile screening unit and if you are accompanied by a man he will be asked to wait outside. If you have any mobility problems please let us know before your appointment as we may need to arrange a different location for you to attend that is more easily accessible. During your appointment you will have an X-ray (mammogram) of each breast to look for any changes in the breast tissue, which may indicate cancers that have not yet caused any signs or symptoms. Your mammogram will be examined by two specialist film readers and the result will be sent to your home address and to your GP within three weeks. It is very important to be breast aware between screenings, as changes can happen at any time. If you notice any changes to your breasts that are not normal for you, get them checked by your GP. If you are not able to attend the appointment you have been given please contact the Breast Screening Office to rearrange. If you do not want to attend for breast screening please contact us to cancel; if you change your mind later you can contact us again for an appointment. If you miss your screening appointment you will be sent a letter offering you the chance to book another appointment. If you choose not to rebook another appointment you will be routinely invited again in three years time. In the meantime if you do change your mind you can contact us to re-arrange your screening. If you have recently moved house you will be invited for screening at the same time as all the other eligible women registered at your new GP practice. If you recently attended for screening elsewhere and have now been sent an invitation for screening in your new area you can still attend as long as your screening appointment was more than six months ago.